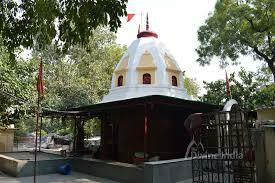 Here is Some information about Kilkari Bhairav Temple in New Delhi India. Kilkari Bhairav Temple is located at Near Old Fort Delhi.The temple was built by Pandavas in Mahabharata times.The temple was dedicated to Lord Bhairava or Lord Shiva. Instead of milk, liquor is offered to the deity of this temple.Although some people believe that it was established by Bheem, one of the five Pandavas of Mahabharatha epic, neither the idol nor the temple seems to be very old. The idol of Bhairav is huge but does not have the entire human body; only the head with two big blue eyes along with a trident is found in the form of idol. 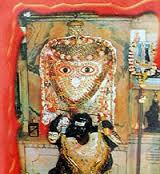 Apart from Bhairav, there are other deities in the temple such as Ganeshji and all. The complete name of temple also suggests that ,its called "Pandav kaleen Sri Kilkari Bhairav Temple" . There are two temples dedicated to Bhairav ji,offering made to the residing deity is alchoal in Kilkari bhairav temple and milk in doodhiya bhairav temple. The unique concrete cow built here, which is under serve as water taps is interesting. Photography is strictly prohibited in this temple. Well, it is written in various places inside the temple that offering liquor is also prohibited in the temple - I am not sure whom do the temple authorities try to make fool. The history of the temple dates to ancient times when Vaishno Devi entered a cave leaving a warrior monkey to guard the entrance. Bhairav then a demon and entered the cave forcefully. This angered Vaishno Devi and she took the Chandi avatar and killed Bhairav by beheading him. The Vaishno Puran mentions that even after being beheaded Bhairav kept pleading to Vaishno Devi for mercy and she forgave him. She also blessed him saying that he will be worshipped by the coming generations. This is the reason why the idol of Lord Bhairav is till the neck. Many believe that the temple is the site where Bheem (the second of Pandav siblings) prayed and attained his powers. 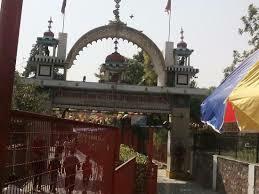 The complete name of the temple is ‘Pandav Kaleen Sri Kilkari Bhairav Mandir’. The temple is known throughout for being alcohol friendly and devotees carry alcohol to serve it to Lord Bhairav. The temple is an ancient one hence the structure is quite old. The way the temple is constructed and its architecture is ancient. However, renovations have been done and today the architecture looks contemporary. There is a unique feature in the temple in the form of a cow built of concrete. Under the udder of the cow are water taps. 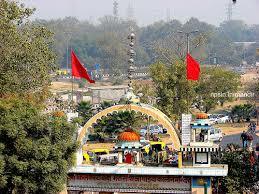 By Road : There are many public and private vehecals available to reach Kilkari Bhairav Temple Delhi. By Metro : The Nearest Metro station is Pragati Maidan. By Air : The Nearest Aairport is Indira Gandhi International Airport Delhi.